Do you remember the place where you had fun the most as a kid? I do. I used to come to Petrosains almost every year from 7-12 years old. It was the best time of my life just participating in the activities and playing with the exhibits found there while learning about all kinds of stuff from Dinosaurs to Astronauts. Imagine my surprise and joy when I got to explore Petrosains again! This time it was for a Hunt called "Break The Code". Think Amazing Race, that is exactly what we face. I got paired up with the other bloggers attending that day, Jessica, Ashley, Syahira and Samantha! It was a Monday morning and there were a total of 80 students from local universities which made up to 20 teams that participated in this event! 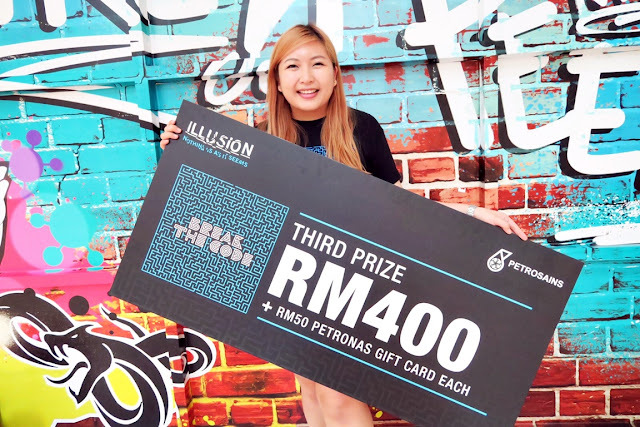 At this hunt, Petrosains, The Discovery Centre and Petrosains’ visiting exhibition, "ILLUSION", were the two areas we got to run around to look for clues. While waiting for the event to start, I realise everyone was so prepared coming in long pants, got their backpacks and everyone looked like they knew what they were doing. While our teams, some were dressed in skirts and we had the funkiest hair colours out of everyone. TBH it was a bit intimidating because I'm not a science based student. I did accounts in high school and so did everyone else in my team. LOL. But we all decided to have fun and just enjoy the day. The Petrosains ILLUSION : Break The Code Hunt started and when we received the first task to decode a page of sentences, we were the first team to actually finished the task out of the 20 teams and manage to move along to the next task! 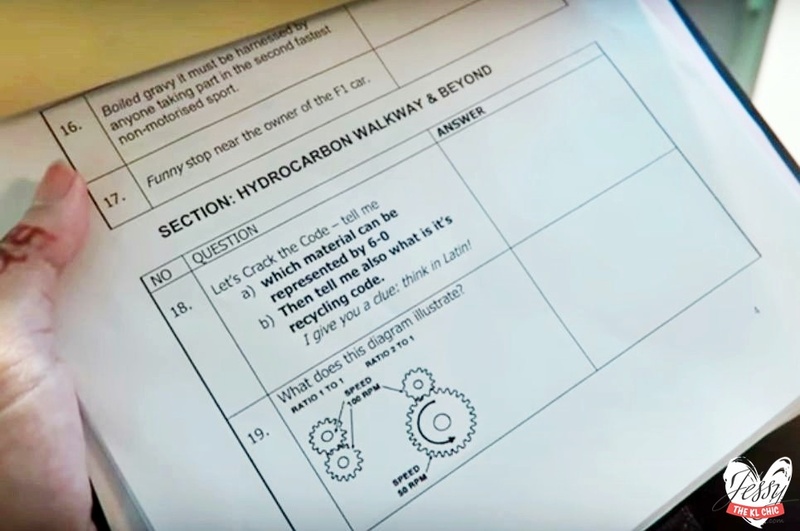 Our next task is to finish 5-6 pages of questions within 3 hours. You should have seen our faces when we got the questions. The questions asked us which stars are on the belt or which material is used to help preserve Malaysia's well. Never encountered such questions before and we all just ran to the place where we could find the clues for the questions. All of us had a goal, we wanted to win! Our hearts were racing and adrenaline rushed through our heads, every team had the same spirit too. While trying to stay focus, there were so many distractions. Let me tell you Petrosains Discovery Centre is HUGE. Thank goodness I wore shoes. We ran pass Geotime Diorama and Time Tunnel to Space. At Space, its so cool because they teach you what astronauts go through for training, what to expect in space, what stars are in space and etc. While we were finding for clues, we can't help but to play around with some of the exhibits. Love how the place gave science a remix with popular culture, music and art. Everything you see, touch or hear will give you a little knowledge of the area you are at. When ever I looked at the walls of Space, there would be names of the star written on it. Imagine if this was the kind of situation found in school? Bet students would be drawn to learn more. There was also a molecule/hydrocarbon area. This have to be the most confusing station as I didn't even understand the questions asked. haha. Time to study science again. The stuff displayed at the area was very unique, there was even a bubble filled with pencils! Next up was Speed. We even got to slide our way down an incredibly long slide. I didnt know that the slide would be fast, hence my shocked facial expression. So take a wild guess what would you see at the Speed area? Petronas + Speed = Formula 1 (F1). There is even a simulation on seeing which driver press their accelerators the fastest. Bet the boys would love this area. Further down there was even a small area to make a toy lego car and to test which car would be the fastest. Oil Platform was the next area we went to. This is the most memorable area for me as it looked the same as when I was 7. Everything still looked so new since then. Everything about petroleum is shared there. Ashley even got the chance to experience going down like how a petroleum engineer would while at the oil plant. We went to ILLUSION area the last. FYI this is a new area in case you are wondering why you have not seen this at Petrosains before. 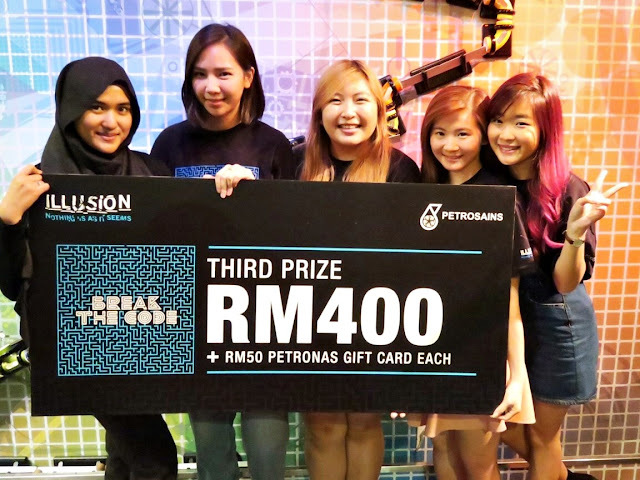 It is currently a visiting exhibition in Petrosains and displays exhibits that challenge visitor's perception, disputing pre-conceived ideas in the mind and getting visitors to use their senses to make sense of how the brain works. ILLUSION will make visitors question what they see and will help visitors to investigate how perception underpins the way one sees, feels, thinks and understands the world. It very psychological. There was a lot of mind trick questions and objects that would amaze you.This exhibition would be available in Petrosains from 4th September 2015 - 10th January 2016. Make sure not to miss it! We went back to Geotime Diorama after Illusion because we saved the best for last. We had about 5-6 questions for that area and did you know that a T-REX Stomach can fit a 8 year old inside?! hahaha. Something I will never forget now thanks to this hunt. Suria KLCC, Petrosains, The Discovery Centre spans 7,000 sq metres and there were other areas that I can't remember now. All sorts of exhibits were there for visitors to experience with and really if you're thinking to have a fun time with friends or just have a good field trip, I would totally recommend this place. There was even a place where the walls and floor were interactive. It means every movement you made there something would move. So as I was walking, a fish appeared on the white floor. AFTER 3 HOURS of running about and cracking our brains, we were done with the hunt. We all sat down and couldn't move a muscle. All of us were tired since it was an early event. As we were all gathered to hear the answers we have submitted, I realize we almost got all of the questions right! Maybe we got 93/100 right. So I was thinking, we could stand a chance to win and guess what?! We actually won 3rd place out of the 20 teams that joined! Was so happy that day, at least all of our sweat and brain juice didn't go to waste. Even the other teams were shocked. LOL. Seriously what an exciting adventure. Can't wait to visit the place again with my friends this time. BTW pictures without my logo was taken by Jessica Chaw :) Really love the quality of the pictures. Since it's school holidays now, bet some of you are bored beyond your minds, why not do something fun while getting to learn something in exchange? Level 4, Suria KLCC, PETRONAS Twin Towers, 50088 Kuala Lumpur. Woots! The challenge looks so cool and you guys are brilliant. Congrats on winning! Wow! Congratulation on winning the third prize! I been to there before and it is so much fun! Wow... how awesome is this.. and congratulations for scoring the third placing... enjoy your booty!!!! so this was the event you told me about. congratulations on the cash prize!! haha.. such a long post with lots of pictures. Nice, i feel like i'm there myself just by reading your blog. Amazing! Looks like a fun event! It would be great to experience this with friends! Congrats btw! 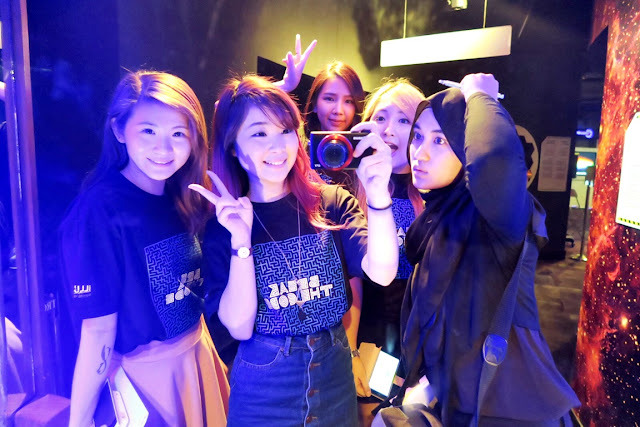 Petrosains is so fun even for adults, must be such a fun event for you gals.